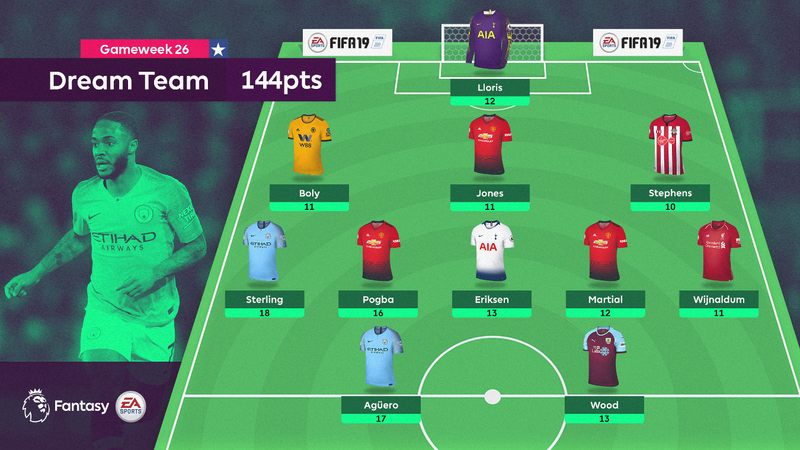 No fewer than five Manchester-based players made it into Gameweek 26's Dream Team in Fantasy Premier League. 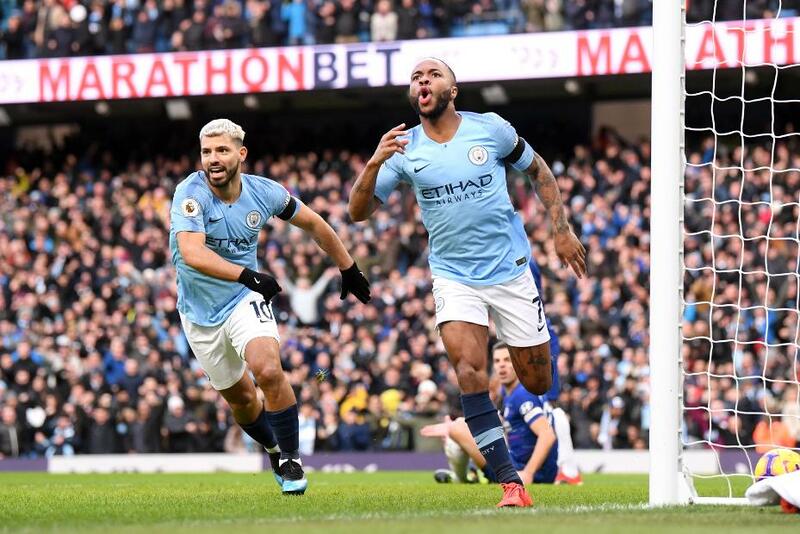 Raheem Sterling (£11.3m) led the way with an 18-point haul in Manchester City's 6-0 defeat of Chelsea. He was joined in the Dream Team midfield by two Manchester United stars as the Red Devils overcame Fulham 3-0. A 3-5-2 formation amassed 144 points in total, with all 11 players making it into double figures. The Tottenham Hotspur goalkeeper's first penalty save since the 2014/15 season proved crucial as his side ran out 3-1 winners over Leicester City. A last-gasp equaliser in Wolverhampton Wanderers' 1-1 draw with Newcastle United was the centre-back's third goal of the season. It also earned Boly maximum bonus points. The Man Utd defender produced all-round returns at Craven Cottage. He kept a third clean sheet in five starts and also provided an assist for his 0.6 per cent ownership. A first goal of the season couldn't stop the Southampton defender ending up on the losing side as Saints went down 2-1 at home to Cardiff City. Two goals, an assist and two bonus points against Chelsea made it three double-figure hauls in five Gameweeks for Sterling. No player can match his five Dream Team appearances this season. The French midfielder's renaissance under Ole Gunnar Solskjaer continued with two goals and maximum bonus points in the win at Fulham. Pogba has now produced returns in eight of the last nine Gameweeks. Eriksen matched his best tally of the season in Spurs' victory over Leicester. He scored, provided an assist and was awarded maximum bonus. Starting his first match in three Gameweeks, the United midfielder responded with a goal and an assist. He is now one goal shy of making it into double figures for the first time since his debut season in 2015/16. Liverpool eased past AFC Bournemouth 3-0, with Wijnaldum's clever lob the pick of the goals. The strike earned him maximum bonus points and a place in the Dream Team for the first time this season. A second hat-trick in three appearances hugely boosted the FPL prospects of Aguero's 32.1 per cent ownership. He is the most-bought player for Gameweek 27, earning over 167,000 new owners, despite City's next league fixture being in Gameweek 28. Burnley stretched their unbeaten run to seven matches with a 3-1 win at Brighton & Hove Albion. Striker Wood's brace means he now has five goals over that period. He's also earned maximum bonus twice in the last three Gameweeks.